Today, 13th January 2014, the two men from Bruqin have been released from prison with a 2000 NIS bail each. Both men are under house arrest until the 24th January and must report to Ariel police station, inside the illegal settlement of Ariel, every 48 hours. On Thursday, 9th January 2014, two farmers from Bruqin, in Salfit district, were arrested by Israeli soldiers. 19-year-old Mohammad Baker and 29-year-old Jaad Baker, accompanied by his 4-year-old son and their 40 cows, entered their land to the west of Bruqin. The land between the village and the industrial area of the illegal settlement of Ariel belongs to villagers of Bruqin and the farmers use it for their sheep and cows. 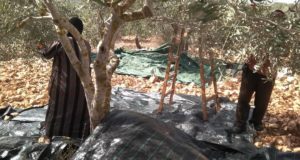 At 11:30am Israeli forces entered the land, which is monitored by a surveillance camera, and arrested the two villagers. They were taken in handcuffs to a jeep nearby, leaving the 4-year-old boy alone in the field with the cattle. The soldiers refused to call any family members so that the boy could be brought home to the village. 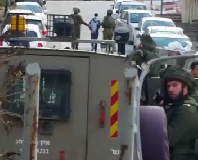 The Israeli forces held the farmers until 2:00pm on the road by the jeep. The men were arrested for entering a closing military zone. The soldiers searched them various times and kept them detained in handcuffs before transferring them to a prison in the illegal settlement of Ariel. Later in the afternoon another family member heard from witnesses of the arrest and went to the field to take the boy home and to gather the cows. The boy is still traumatized. Furthermore five of the forty cows remain missing. The villagers believe that settlers from the illegal settlement of Bruchin have stolen the cattle. Israeli police have refused to investigate, claiming that they have other issues to deal with. 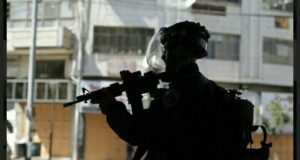 On Saturday morning a police officer called the family to inform them that the prisoners are being held in Ariel and that tomorrow after the Jewish holiday they will be transferred to Haderim prison in Israel. A court hearing is due to be held on Monday, 13th January in the military court in Salem. A lawyer is dealing with the case.